"The real Hindu astrologers make a scientific study of the law of causation governing human actions and they are not satisfied with telling you the past or predicting your future only. They teach you the art of averting an unwelcome event or stimulating the fruition of a desirable event coming to you as a result of your past evil or good actions. Good astrologers tell their students only what will benefit them, and do not like to satisfy idle curiosity. They say there is no use in telling you what is coming to you anyway unless one can also show you the way to control or regulate your self-created destiny. Otherwise ignorance is bliss." The rishis developed Jyotish (literally: the science of light), being the forerunner of modern Western astrology by at least 3,000 years. They also identified the prevailing gem attributes, their vibrational energy fields and the planetary radiations they harmonize with. Jyotish thereby allowed for the prescription of specific gems to counteract any badly placed planetary positions in a person's chart. It is important to note that the ancient Jyotish gem prescription system subscribed to by most reputable Vedic astrologers, should not be confused with the Western planetary gemstone system which has, regrettably, become widely accepted. Its origin is partially attributed to the early Hebrew civilization. That area's limited access to gem varieties, coupled with the lack of remedial gem understanding by its adherents and practitioners, has cast great doubt on its usefulness, particularly by Jyotish scholars. The Western system was essentially incorporated as an exercise in commercial opportunism by the American National Retail Jewelers' Association in 1912, a situation which exists to this day. Usually in Western astrology the cusp of a new sign starts around the 22nd of each month. As the Western system (A.N.R.J.A.) represents the month, and not the sign, it cannot seriously be considered astrologically representative. Western astrology gains its influences from the classic Greek civilization of less than 3000 years ago. Several scholars have suggested its foundation was gleaned from both the Babylonian and Egyptian cultures. Ancient history, however, goes back even further to suggest that though astronomy and astrological science were changed greatly by time and the cultural boundaries of these later civilizations, originally they were already highly advanced in the civilization along the Indus river 6000 years ago. Remedial use of precious gemstones for healing and karmic change is an ancient science in India. According to legend the Goddess Parvati, consort of Lord Shiva , asked him to find a new way to alleviate humankind’s suffering. According to the ancient texts of the Ratna Rasayna and Damar Tantra, wearing gems in contact with the skin offers a unique bounty of electromagnetic radiations via their molecular intelligent alignment, giving a supplementary boost of needed energy or resonance that stimulates the glands and other parts of the body into a more vital balance. This energy absorption occurs via the chakras along the spine, from which all the organs draw their needed different energy requirements. The ancient Kurma Purana explains that all creation is made of rays or radiations, in complete agreement with the more modern outlook of quantum physics, namely that these rays or waves are the foundation of our material and ether-based Universe. Principally there are nine rays or the nine colors of the rainbow (infra-red, red, orange, yellow, green, blue, indigo, violet, and ultra-violet) which, when harmonically balanced, create white (visible) light. As well as the color vibrations of the nine planets, there are the seven notes of music (Sa, Re, Ga, Ma, Pa, Dha, Ni, Sa), the seven systems of Ayurveda (Chyle, Blood, Flesh, Fat, Bone, Marrow, Sperm), the five panchbhutas (Earth, Water, Fire, Air, and Ether), the five primeval Vayus (Prana, Apana, Samana, Udana and Vyana), and the five senses (Smell, Taste, Touch, Sight, and Hearing). 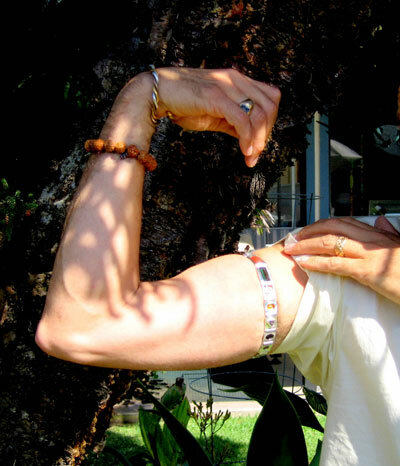 All of these energy systems can resonate and complement the nine cosmic colors and when out of balance can be stimulated to greater balance and strength through the use of astrological ayurvedic gemstones, as well as other stimuli such as pujas, mantras, affirmations, positive thinking, prayer, herbs, bio-energy healing, blessings from saints or advanced souls, fasting, and so on. The evolution of humanity has interacted and developed with the subtle environmental electrical influences of the planets. Because most humans do not realize that our life force or vitality is electrical in nature, they do not follow a lifestyle or scientific interest that is strengthening and uplifting to it . All radiations that have a frequency of pure color can be used in a strengthening, vitalizing, balancing, and healing manner. The use of benign rays for optimum equilibrium keeps the mind and body healthy. Our absorption of these rays is continually adjusting dependent on our karmic blueprint, formed by past thoughts, words, and actions in previous lives and in this one. When our receptivity to these essential life giving rays is limited due to negative past karma, it is then that a gemstone's subtle electromagnetic radiation can be most helpful. "Sanskrit was the mother of Europe's languages; she was the mother of our philosophy, mother, through the Arabs, of much of our mathematics (Arabic numerals in fact came from India! ), mother... of the ideals embodied in Christianity, mother, through the village community, of self-government and democracy." Vedic astrology (Jyotish), however, has the unique claim to have been established by illumined sages of self-realization whose intuitive rationale appears to be the oldest record of this cosmic science. To briefly explain how different the two systems are, the more psychologically leaning Western astrology generally uses the Tropical Zodiac, and the more specifically predictive Vedic astrology uses the Sidereal Zodiac. These zodiacs differ by 23 degrees. Thus a person can have an Aries sun sign in the Western system and a Pisces in the Eastern system. Of course, in both systems one can get useful readings for great benefit, however, only in the Vedic system has there been a 6000 year old respected use of remedial gems for afflicted planets to alleviate the individual's negative karma and thus strengthen their chart as a whole. According to Vedic astrology, during the different yugas, man's ability to receive sufficient cosmic energy via the planetary and stellar radiations is controlled by the amount and balance being projected during that particular yuga. One analogy of the way the needed planetary recipe descends upon the earth is to compare the individual planetary rays to the different colors of a rainbow. During the Satya Yuga (golden age), when man's spiritual, mental and physical health should reach its height, it is greatly helped by the fact that the colors are of a rich strong tone, whereas in Kali Yuga (Dark Age), the same rainbow will be much less vibrant and more of a weak pastel nature. During such a cosmic deficiency, fruit will take longer to ripen, plants and animals will grow more slowly, healing will take much longer and misunderstanding and misery will be much more prevalent. And especially in the Kali Yuga, truth in its many forms, if disguised with any subtlety, will be uncomprehended. At the beginning of every yuga there is a sandhi (mutation period of adjustment) while man sheds the previous yuga's ways of thinking and institutions. Swami Sri Yukteswar wrote that in the Dwapara Yuga the human intellect will be able to comprehend the fine matters, or electricities and their attributes, which are the creating principles of the external world. Hence, from the point of timing, it is easy to see why a service specializing in the karmically mitigating electro-magnetic radiation of gem bangles has not been able to gain a foothold in the West earlier in this yuga. In the recent Kali Yuga, because of the weak cosmic radiation having been received by the Earth, the astro-physical influence strongly affected man's lifespan. It was much shorter and his mental virtues (intelligence and pursuit of dharma) were also only one-quarter developed. Now in the present Dwapara Yuga, man's mental virtue will double and become half complete. His life-span and health will also afford the opportunity to improve dramatically. 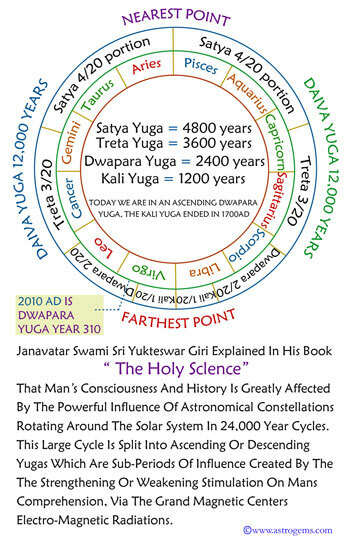 According to Sri Yukteswars placement of the yugas in his book The Holy Science, he explains clearly that we have been in Dwapara Yuga for 296 years (1996). Hence, as one can see from the great changes in society over the last two hundred years, a very obvious transition in man's consciousness is developing. Naturally the likely impact of any astrological influence can be changed by man, gems and metals being only two of the methods. Best of all procedures is the use of correctly guided will power. However if, as in Vedic philosophy, intelligence is measured by the attainment of permanent bliss, history shows these great souls to be a rarity. And thus the Vedas suggest many practical aids to reach this goal. Of course, applying the advice of saints, correctly practiced yoga meditation, affirmations, sincere prayer, correctly guided will power, Japa, pujas, suitable diet and judicious fasting are also especially beneficial practices to destroy karma, but these procedures require effort. Therefore many Vedic astrologers also recommend gems and metals as a more passive, but potent way of lessening karmic problems. An often overlooked fact is that through the change of a person's physical vibrations by absorbing the beneficial and strengthening gem's radiation, their resolve to tread their correctly guided path can be significantly enhanced.